All ships auto-aggro a few seconds after warp-in. Kill Slaver Ship to get complete, scoop up the Freed Slaves from can to turn in. No standing loss for only Slaver Ship. Crusiers and above are NOT allowed. Even with Destroyer, Slaver Ship is very heavy ship. Hard to shoot him down. At long range, he is very dangerous. He can hit you 25-50 and very sometimes 250, even at 32 km range. You can die quick if your ship is not strong enough. But the ship has weakness: he has no short range weapons. He has a module to slow you down a bit. The area has some Veldspar ores. A Hulk isn't allowed through the gate, for mining. 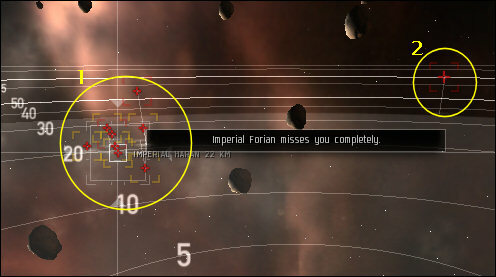 FACTION BALANCING: A fellow Unista, "Algot Tram", tells me that he ran this mission and got two standing losses with the Amarr Empire for "Combat - Ship Kill": A -0.011% and a -0.004%. If this information is correct, then the standing losses are negligible. I have not tested this personally. have shield booster and armor repair equipped. I also equipped extra reactor control units to accommodate my 150 mm guns. either zig-zag or tank your way within 1 km of the Slaver Ship, and orbit at 1 km. It won't be able to hit you at all. If you've taken damage coming into orbit of it, just activate your repair stuff until you're back at 100%. You should use an afterburner to close the distance as quickly as possible. Harpy with (4) gauss prototypes shooting antimatter. Soon as I was out of warp, turned and burned to the slaver. When I was w/i 21km I opend fire and before I could get w/i 4000m he'd popped and the cargo was waiting for me. I ONLY killed the slaver and I took a -0.011 % Amarr hit.